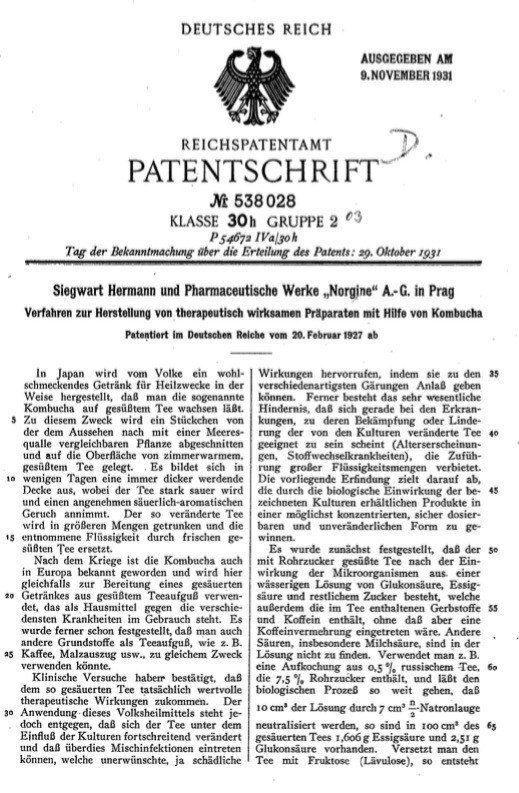 The Original Old German Patent is on page 2. Introduction The first reference to the production of Kombucha in a concentrated form comes from Wiechowski (1928) and Hermann (1929). Hermann regarded it as essential to have a preparation made up according to the principles of the cultivation of pure cultures, and of unvarying composition, so as to be able to draw comparisons. 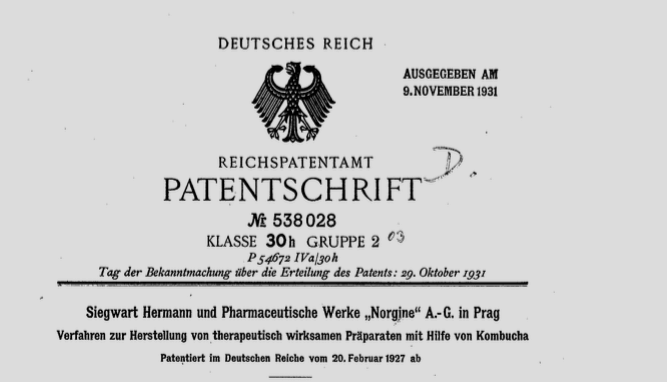 The Norgine pharmaceutical works in Prague-Aussig declared themselves willing to produce an experimental preparation made up to Hermann's prescription. This preparation was then distributed to chemists' shops under the name "Kombuchal". "Kombuchal" (German Reichspatent 538 028) was made from a culture liquid that was fermented to a specific degree of acidity and reduced to a specific concentration by means of vacuum distillation. It contained all the substances produced by the Kombucha culture except for acetic acid and alcohol, which no doubt evaporated as easily liquefied component elements together with the aqueous part. Hermann and a series of doctors at the "Clinic for Internal Medicine", in Prague all worked with this preparation. Hermann writes that the doctors at the clinic commented on the extraordinarily favorable effects, but adds: "Although all those who tested it, be they clinicians or general practitioners, can testify to rally favorable effects on symptoms of senility and on arteriosclerosis and the symptoms connected with it, they nevertheless hesitate to publish, just because folk remedy is encumbered with a certain prejudice." The Kombucha Drops available commercially today are described by the manufacturers either as elixir or as pressed extract. The latter term gives a clue as to the manufacturing process. Apart from that, the manufacturers pursue an information policy of great reticence about the way their preparations are made. The idea of pressing the Kombucha culture seems to stem from Dr. Sklenar. He used the expressions "Kombucha mother tincture" and Kombucha Drops D1. In Japan a pleasant tasting beverage for healing purposes is produced by the Japanese people, by letting the so called Kombucha grow on sweetened tea. For that purpose a piece of this plant (this plant being comparable to a jellyfish with regard to what/how it looks like) is cut and placed on the surface of sweetened tea which has room temperature. In a few days a layer getting thicker and thicker has formed and while this is happening the tea is getting very/strongly sour and takes on/picks up a pleasant sour-aromatic fragrance/aroma. The tea, changed this way, is drunk to a higher amount and the withdrawn liquid is replaced by fresh sweetened tea. After the war Kombucha became known in Europe also. Here it is also used for production of a soured/acid (slightly acid) beverage from sweetened tea brew, which is used as household remedy for/against various illnesses. It was already discovered further that other raw materials than tea brew, like coffee, malt extract etc. can be used for the same purpose. Clinical experiments have proven, that this in this way soured tea actually/in fact has valuable therapeutical properties. Against the use of this folk medicine is to say that the tea changes progressive under the influence/influx of the cultures und that -beyond that- mixed/hybrid infections can happen, which have unwanted, yes even damaging effects, due to eventually letting happen the most different kinds of fermentation. Further there is the important/essential obstacle, that just/right with those diseases, this tea (which has been changed through the cultures) seems to be suitable/good for fighting against or relieving them (signs of old age, illnesses of metabolism), the intake of high amounts of fluids is not allowed. The aim of the here presented invention is to win/produce/obtain those products (which are available through the biological influence/effects of the mentioned cultures) in a most possible concentrated, safely dosable and unchangeable form. It was found first that tea sweetened with cane sugar and after being influenced by microorganisms is composed of: a watery solution of Glukonsäure, Essigsäure (= acetic acid) and rest-sugar [translator: I don't know how to translate "Gluconsäure" C6H10O7. There is also Glucoronsäure C6H12O7 probably called glucoronic acid in English. Both are said to be found.] Further this solution also contains "Gerbstoffe" [translator: no translation found in my dictionary] (which can be found in the tea) and caffeine, but no increase in caffeine has happened/taken place. Other acids, especially Milchsäure (=lactat) can not be found in the solution. If one takes a "Aufkochung" [translator: no translation found in my dictionary; description: something which was brought to boil] of 0,5% Russian tea, which includes 7,5% cane sugar, and lets the process happen so far that 10cm3 of the solution are neutralized by 7cm3n/2 Natronlauge (= sodium lye ??? ), we get 1,606g acetic acid and 2,51g Glukonsäure in/on 100cm3 of the soured tea. Does one give Fruktose (Lävulose) [Fruktose = fruit sugar] to the tea one gets only acetic acid while a strong skin/membrane production takes place. But in the case of in tea soluted Glukose one exclusively gets Glukonsäure and that without the developement of skin/membrane. In case of technical Glukose [???] we also find acetic acid, even so in a far less amount compared to taking Saccharose, and after a while (a lot later compared to Saccharose-including solutions) there can be found skin/membrane developement. Does one use sugar solutions with pepton-"rich" [translator: "rich" in the sense of "containing"] substances or even just anorganic ones, the biological change of the sugar happens in the same way. Depending on the used kind of sugar of a acid/acids only acetic acid or exclusively Glukonsäure or, in the case of taking Saccharose as starting substance, a mix of both of these acids are produced. With the here presented invention those Glukose-or Saccharose-"rich" "Nährlösungen" [translator: might be translated as: "fertile solutions"] are soured up to a certain level of acidity with the help of from the Japanese Kombucha won/developed cultures. After that –at best/if need be after neutralization of the acids- they are thickend until we get a "haltbaren" [=well keeping/durable] syrup. The grade of acidity has an upper limit (if the acid is not become dulled) in the way that very sour products have an unpleasant taste and are not agreed with positively in the end [translator: in the sense of '"eggs don't agree with me"]. It is advisable to make Calciumsalt from the Glukonsäure, doing this with the help of CalciumOxid or chalk. In the case of starting from Glukose this happens by the produced Glukonsäure slowly becoming dulled in the moment of its emergence/production or after the stopping of the Säuerung (souring process). In the case of processing Saccharose, acetic acid emerges also and can be removed before the neutralization of Glukonsäure which can be done most easiest with the method of "Abdampfen" [translator: ?? ?exhaust steam???] of the solution or by blowing steam or air through it. The syrup, being produced in one way or the other, is constant in its effect, even though a crystall mush/paste/porridge can form spontaneously through the spontaneous crystallization of glucon-sour Calcium. But the preparation can also be brought into a solid state. This is done by letting the free Glukonsäure, which the syrup contains, become Lakton. Does one place the syrup above substances, like concentrated sulfuric acid, which are known to withdraw/extract water, the syrup gets solid after several days. This process is done best in a vacuum-container/cupboard. The strong sour flavor/taste has become sweet. The produced/developed Lakton does very quickly transform back into the free Glukonsäure if brought into contact with water. By/through traces of miniral-acids this process is accelerated. In this way one can produce tablets, dragees etc. which seem to always have/be composed of the same amount of therapeutically effective substances, if the process is stopped/interrupted at a specific acid-level. Does one wish to get rid of the Glukonsäure-component, the syrup is freed from the Glukonsäure to a part or completely by letting the glucon-soured Calcium crystallize. At most it is further constricted or "eingedampft" [steemed until thick] until being dry. If the cultures degenerate, a regeneration of the cultures can be achieved by filtration of the solutions. External signs of degeneration are that the tough/glutinous skins break and get brown (those skins developed during the biological change of glucose- or saccharose"rich" solutions) and that in the whole liquid/fluid there are brown shreds swimming around. Pouring the solutions through paper filter, for example, they get back their normal look after a short time and their normal composition again. I. Method for production of therapeutically effective preparations by souring sugar-containing fertile solutions with Kombucha. This method is characterized by souring glucose- or saccharose-containing fertile solutions up to a certain grade of acidity with the help of fungal cooperatives/cultures and thickening them until a well keeping syrup is developed. At most there is a neutralisation-process of the developed acids before the process of thickening. II. Method according to claim 1 [translator: in the sense of "right"] is characterized by letting the Glukonsäure, which developed during the process of biological oxidation of glucose-"rich" fertile solutions, become the Calciumsalt (this is already done while Glukonsäure develops or after ending the process of souring). Afterwards the solution is thickened until a well keeping syrup is the result. III. Method according to claim 1 is characterized by the process of removing acetic acid from the solution after the process of souring. Acetic Acid develops during the process of biological oxidation of saccharose-"rich" fertile solutions. Removal/Elimination is done by "Abdampfen" or blowing steam or air through the solution. After that the Glukonsäure is"made into" the Calciumsalt and the solution thickened until a well keeping syrup is the result. IV. Way of Implementation according to claim 2 and 3 characterized by letting the syrup take solid form. In order to do that Glukonsäure is made to take the form of Lakton. Way of Implementation according to claim 2 and 3 characterized by freeing the syrup from Glukonsäure to a part or completely by letting glucon-sour Calcium crystallize. At most it is further constricted or steamed until dry. One of the first things that I found strange was their addition of "Calcium" This was I believe done to neutralize the acetic acid and foster Gluconic Acid. However I thought it was those acids that offered many of the benefits to the kombucha drinker. This would also seemingly affect the pH of the kombucha which as I understood it was also beneficial. My opinion is that kombucha - although acidic - is an alkaline forming food . With the addition of Calcium that should change. The Patent also claims that the evaporation process reduced the alcohol (yes) and the acetic acid (no). at least according to our test. see Lab Analysis we conducted. Our test showed 50 times the gluconic acid and 35 times the acetic acid. Though rationally the acetic acid was reduced. but still concentrated above the ratio of freshly brewed Kombucha Tea (1% gluconic acid and 0.7% acetic acid.) a 1:0.7 ratio. According to Traditional Chinese Medicine, Kombucha balances the Middle Qi (Spleen and Stomach). By aiding the stomach to better digest food and by assisting the spleen to deliver more nutrition, the body heals itself. Today kombucha is normally brewed between 6-8 days when it arrives at a semi sweet sparkling apple cider taste. Aged kombucha (8-14 days or longer) produces a sharper vinegar taste with a higher perceived medicinal value though less appealing taste. Kombucha brewed in the ancient Continuous Brewing method achieves a fuller balance of beneficial nutrients with a more controlled flavor. Thus Kombucha helps to break stagnation, reduces damp and phlegm and expels toxins from the body. Hence the Chinese reference to kombucha tea as the “Elixir of Life”. As a Pro-biotic: Acidic kombucha, pH 2-3.5 aids the Stomach (both in the TCM and western sense) in the breakdown and digestion of food ingested. Beneficial bacteria and yeasts, that comprise the Live Kombucha Tea or Pressed Extract (as opposed to pasteurized, neutralized, alcoholic or dead kombucha) compete with and help remove (suppress) harmful bacteria, yeast, parasites. (Probably why Candida sufferers can drink Kombucha Mushroom Tea). Then due to the synergism of the stomach acids and kombucha (Acid and Alkaline meets Yin and Yang, Herman Aihara ISBN 0-918860-44-x), kombucha transforms into an alkaline forming substance. Now the transformed Alkaline kombucha pH 7+, aids the Spleen (function in TCM), intestines, gall bladder and pancreas (function in western speak) in metabolizing and distributing that digest throughout the body. Thus IMHO, kombucha truly holistically balances & harmonizes the body. The actual pH of the body changes. As researched recently by Dr Barefoot (Calcium Factor) and earlier by the Germans “Kombuchal” see German Reichspatent 538 028 online in both the original German and an English translation offered by Harald Tietz and others. In China Kombucha has been referred to as the “Elixir of Life” in the west it is commonly called a SCOBY: Symbiotic Culture OF Bacteria and Yeast. IMO, the symbiosis is not between the bacteria and yeasts but between the kombucha ferment and me. This is one explanation why kombucha works for some and not for others. Kombucha simply makes your body healthier by enabling better assimilation of food, drink and thoughts. That was that and now is Now. Law360, Los Angeles (April 13, 2016, 7:04 PM ET) Ganeden Biotech Inc. slapped a Washington brewery and a California kombucha producer with a suit in Ohio federal court Wednesday accusing them of infringing at least one of Ganeden’s patents for a probiotic bacteria and engaging in unfair competition. The suit claims that if the companies’ labels were accurate, they infringed U.S. Patent Numbers 7,713,726 and 8,697,055. But because Ganeden is the source of GBI-30, it said it believes the products probably didn’t have the strain and that the defendants mislabeled the teas. “Ganeden now files this lawsuit to put an end to defendants’ continued infringements and misrepresentations,” the suit said. Ganeden was founded in 1997 and has more than 100 patents for probiotic technologies in the food, beverage, animal health and personal care industries, according to court papers. In December 2013, B&R allegedly started offering multiple flavors of its “búcha”-branded kombucha teas that were labeled and advertised as containing Bacillus coagulans. By February 2014, B&R was allegedly saying online and on product labels that its teas had the GBI-30 strain. The flavored teas at issue include blood orange, grapefruit sage, guava mango, raspberry pomegranate, verbana rose, masala chai and lemongrass ginger. Ganeden says American Brewing and B&R allegedly misrepresented the nature and ingredients of the teas in violation of the Lanham Act and Ohio’s state law prohibiting deceptive trade practices. The patents-in-suit are U.S. Patent Numbers 7,713,726 and 8,697,055. A method for producing vontherapeutisch effective preparations using Kombucha In Japan the people a tasty Drink for medicinal purposes made in a manner that allowed the so-called Kombucha grown on sweetened tea. For this purpose, a Bit cut off from the appearance comparable to a marine jellyfish plant and in room temperature on the surface of, sweetened tea set. , It forms in a few days becomes thicker end swelling, where the tea is highly acidic and accepts pleasant sour-aromatic odor. The so altered tea is drunk in large quantities and the liquid withdrawn replaced with fresh sweetened tea. After the war, Kombucha has become well known in Europe and is also here to prepare a beverage from acidified sweetened tea infusion used, which stands as a home remedy against various diseases in use. It has further been found,that could be other raw materials as a tea infusion, such. as coffee, malt extract, etc., use for the same purpose. Clinical trials have before confirmed that the so acidified tea actually get valuable therapeutic effects. Of the Application of this popular remedy is, however, contrary to that of tea under the Ejnfluß the cultures progressively changed and that, moreover, can occur mixed infections that cause unwanted and even adverse effects by the diverse fermentations may give rise. Further, there is very significant obstacle that the just the diseases, for combating or alleviating seems to be suitable by the cultures altered tea (aging, metabolic diseases), supplying large amounts of liquid probiotics. The present invention aims, the products obtainable through the biological effect of the indicated cultures in a possible concentrated to win safely dosed and immutable form. It was first determined that the sweetened with cane sugar tea after the action of microorganisms. an aqueous solution consisting of gluconic acid, acetic acid and residual sugar, which also contains tannin and caffeine in Teeenthaltenen without but that a caffeine increase would have occurred. Other acids, especially lactic acid are not to be found in the solution. Using, eg. as a Decoction from o, 5 01 "Russian tea containing 7,5 0 (o cane sugar, and can go as far as the biological process that 10 cm 'the solution by 7 cm3 2 -Natronlauge be neutralized so 1,6o6 g acetic acid and 2 g gluconic _S1 exist in ioo cm 'of leavened teas. Puts\ one tea with fructose (levulose), we obtain under heavy skinning only acetic acid. Hingegen_ generated from dissolved in tea glucose exclusively gluconic, without skinning. When using technical glucose to-deviated well acetic acid forms, albeit in much smaller quantities than when starting from Sucrose, and makes itself after some time -Much later than in sucrose-containing solutions - even skinning noticeable. If one uses. instead of tea peptonhaltige or even anorgaische substances containing sugar solutions, the biological change of the sugar takes place in the same way, so that, therefore, depending on the type of sugar used by acids only acetic acid or gluconic or, when starting from sucrose, a mixture these two acids produced. According to the present invention this kind are carbohydrate solutions containing glucose or sucrose-containing nutrient solutions using from Japanese Kombucha developed cultures acidified to achieve a certain Aziditätsgrades and then, if necessary after prior neutralization of acids, concentrated until the formation of a tough syrup. An upper limit is the degree of acidity, if the acid is not blunted thereby set that very acidic products, have an unpleasant taste and finally also be poorly tolerated. It is recommended to the gluconic using calcium oxide or chalk in the calcium set out above. When going out of glucose, this is done either by gradual dulling of Giukonsäure formed at the moment of their creation, or after completion of the acidification. While processing sucrose can be removed prior to the neutralization of gluconic the -in this case mitentstehende acetic acid, which most easily by Evaporating the solution or by blowing steam or air happens. The syrup produced in the one or the other's way in its effects to be stable if can glukonsaures Calcium.ausscheiden by spontaneous crystallization, so that a crystal is formed. The preparation can be but also bring in solid form by the contained in the syrup, free gluconic is converted into the lactone. If one the syrup over dehydrating agents, eg., via concentrated sulfuric acid, which is best done in a vacuum cabinet, so the syrup is to several days fixed. The strongly acidic flavor has passed into a sweet. The resulting lactone is transformed on contact with Water very quickly back into the free Glukonss, acid back. ! By traces of mineral acids, this regression is accelerated. In this way can be tablets, coated tablets produced, etc., which, when the biological process has been interrupted at a certain degree of acidity always same amount of therapeutically active substances seem to contain. , it is desired to eliminate the Glukonsäurekomponente, so the syrup is Auskristallisierenlassen of glukonsauren calcium from free of gluconic acid partly or entirely and possibly further concentrated or evaporated to dryness. When the cultures degenerate what outwardly thereby indicating that the or biological alteration of carbohydrate solutions containing glucose sucrose-containing solutions tough skins formed are brittle and brown and that swim around brown shreds throughout the liquid. can be a regeneration of cultures by filtering the solutions bring. If the solutions, for example by paper filter cast, show so .she, 'after a short time its normal appearance and their normal condition. CLAIMS: i. A method for the preparation of therapeutically effective preparations by acidification sugary nutrient solutions with Kombucha. 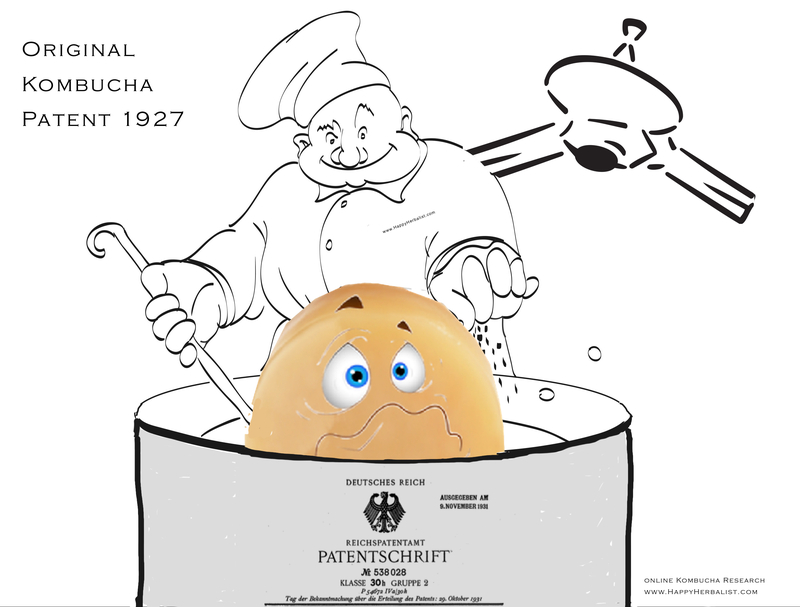 characterized in that carbohydrate solutions containing glucose or Saccharomyces "-comprising nutrient solutions by the action of the fungus to the cooperative leavened achieve a certain Äziditätsgrades and, most nachvorheriger neutralization of the acids, to the origin a durable syrups are concentrated. A. method according to claim i, characterized. that the biological oxidation of converted gluconic glucose-containing nutrient solutions formed in the course of their formation or after completion of the acidification in the calcium salt and the solution is afterwards concentrated until the formation of a tough syrup.3. method according to claim i., Characterized in that the in the biological oxidation of sucrose-containing nutrient solutions acetic acid formed by the acidification of the solution, expediently by evaporation or by blowing steam or air. removed, converted to gluconic only afterwards in the calcium salt and the Solution is finally concentrated until the formation of a tough syrup. 4 .. embodiment of the method according to claim 2 and 3, characterized in that the syrup is brought by conversion of gluconic to lactone in solid form. 5. embodiment of the method according to claim 2 and 3, characterized in that the 'syrup by Auskristallisierenlassen glukonsauren of calcium from the gluconic acid partly or entirely is freed and possibly further concentrated or evaporated to dryness. - end of OCR Translation. copyright www.HappyHerbalist.com all rights reserved June 2016.